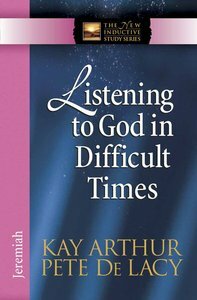 ^With sales of more than 1.4 million copies, Kay Arthura (TM)s deeply enriching New Inductive Study Series is nearing completion. In this newest study, readers will mine gems of truth from the book of Jeremiah using the hands-on process of observation, interpretation, and application to dig through the text. ^Jeremiaha (TM)s warnings to a nation that has turned its back on the Lord echo through the ages and speak to cultures today. As readers see the propheta (TM)s heartbreak at the nationa (TM)s apostasy, his sense of urgency, and the resistance he faces, they will identify with Goda (TM)s people throughout the ages and receive assurance that nothing happening today is taking God by surprise. Even in the darkest seasons, readers can be confident that evil will be judged, righteousness will be rewarded, and Goda (TM)s plans for His peoplea "to give them a future and a hopea "stand firm. About "Listening to God in Difficult Times (New Inductive Study Series)"
Pete De Lacy is the coauthor of several studies in the New Inductive Study Series and a contributor to The New Inductive Study Bible; Discover the Bible for Yourself, and How to Study Your Bible. Pete is also a featured teacher on many Precept Upon Precept videos and at Precept Ministries conferences.